After traveling 300 million miles, Spirit's twin rover Opportunity landed on Mars in a small shallow crater--the perfect place to look for signs of ancient martian water. 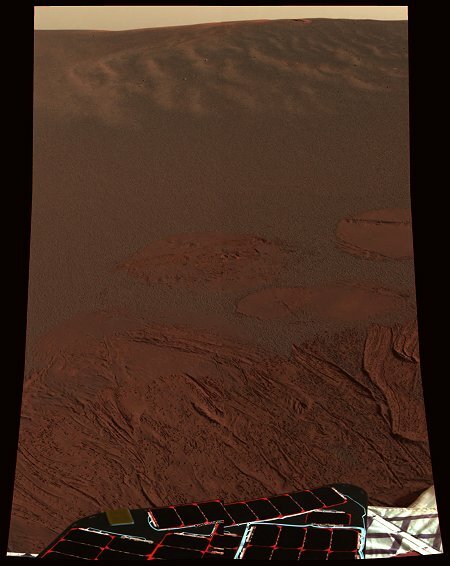 January 26, 2004: Spirit's twin rover, Opportunity, landed safely on Mars Saturday night, Jan. 24th at 9:05 p.m. Pacific Standard Time, and it soon began beaming images back to Earth. "Opportunity has touched down in a bizarre, alien landscape," says Steve Squyres of Cornell University, principal investigator for the science instruments on Opportunity and Spirit. "I'm flabbergasted. I'm astonished. I'm blown away." 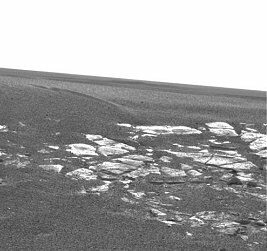 Compared to Spirit's rock-strewn landing site in Gusev Crater on the other side of Mars, the terrain around Opportunity is darker and remarkably smooth--interrupted only by the bounce marks of the lander's airbags and a curious outcropping of layered rocks. It's the first accessible bedrock outcropping ever seen on Mars, and scientists are eager to study it. Before the landing, says Squyres, "my fondest hope was that we would land close to a crater that we could visit." In such a place, Opportunity could see what lies below the surface of the plain without having to dig. What happened is even better than Squyres hoped. "We scored a 300 million mile interplanetary hole in one," he says. "We are actually inside a small impact crater" about 20 meters (66 feet) across. It's shallow, so Opportunity should have no trouble driving out when its done exploring the crater's interior. An even bigger crater, which could provide access to deeper layers for more clues to the past, lies only about 1 km away. It was photographed by a camera on the bottom of the lander during Opportunity's final descent. The bigger crater is about 150 meters (about 500 feet) across, says JPL's Andrew Johnson, an engineer who works with the descent imaging system. Squyres presented an outline for Opportunity's potential activities in coming weeks and months. After driving off the lander, the rover will first examine the soil right next to the lander, then drive to the outcrop of layered-looking rocks and spend considerable time examining it. Then the rover may climb out of the small crater, take a look around, and head for the bigger crater. But first, Opportunity will spend more than a week -- perhaps two -- getting ready to drive off the lander, if all goes well. Engineering data from Opportunity returned in relays via NASA's Mars Odyssey orbiter indicate the spacecraft is in excellent health, said JPL's Arthur Amador, mission manager. Stay tuned to NASA's Mars Exploration Rover Website for the latest information about Spirit and Opportunity.